A home is a big asset for many Americans, so it is no surprise that most of our income is used for housing expenses. Mortgage, taxes, and home improvements (remodeling projects) are a costly endeavor. The latest data released by the American Housing Survey estimates that in years 2013 thru 2015 more than 123 million home improvement projects, not including routine maintenance, were carried out in the U.S. This accounts for a total of more than $431.1 billion dollars in expenses. Upgrading a house through decoration and renovation not only increases its value, but it also brings pleasure and satisfaction to those who live in it. That’s why there were 43.9 million households that engaged in home improvement projects in the last two years. Around one-third, or 33.6 percent, of owner-occupied units completed at least one home improvement project for energy-efficiency purposes, 6.8 percent to improve accessibility for an elderly person or person with a disability, and 3.5 percent carried out at least one project to prepare the home for sale. The median expenditure per job was $1,200, and out of all the home improvement projects, nearly 62 percent were carried out by professionals whereas the remaining 38 percent were DIY. Moreover, the greatest majority, 77.5 percent to be exact, used cash savings as the primary source for funding these projects. Americans spent the most on exterior additions and replacements, that is 27.9 percent on home attachments such as a garage, porch, patio, terrace, roofing, siding, chimney, or windows. 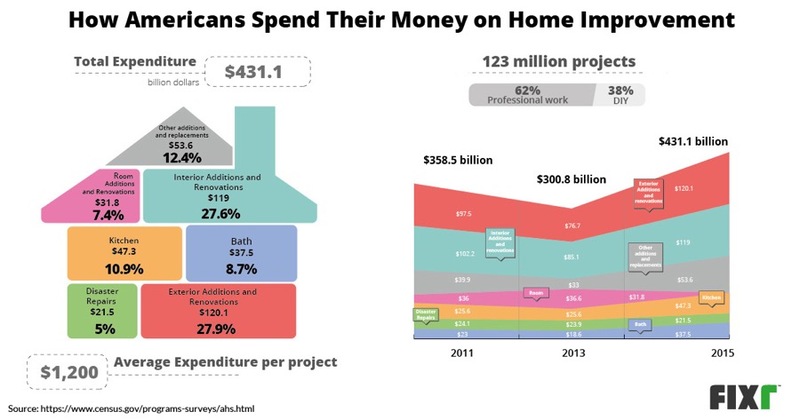 Another 27.6 percent of total home improvement expenses was for projects such as insulation, water pipes, plumbing fixtures, electrical wiring, security systems, flooring, among other interior fixes. In this category, upgrades on HVAC –Heating Ventilation, and Air Conditioning– represent 9.3 percent of total expenditures with an average of $3,092, which is above the median. Accounting for 12.4 percent of total expenditures was lot or yard additions. That means driveways, walkways, fencing or walls, swimming pools, and recreational structures were third in home improvement costs. Other popular home improvement expenses were for kitchen remodeling, 10.9 percent, and bathroom remodeling, 8.7 percent. The remaining expenditures were as follows: disaster repairs 5 percent and other room additions and renovations 7.4 percent. We also explored historical data from 2011 and 2013 surveys to present a bigger picture in the home improvement market. Comparing data from the two previous surveys, we found that despite a decline in home improvement expenses from 2012 to 2013, the latest numbers show a very considerable upturn. Although interior and exterior additions and replacements are quite high in the percentage of total money spent, there’s a significant difference in the number of projects completed. Out of the more than 123 million home improvement projects, 52.7 percent were interior additions compared to only 20.1 percent of exterior. The reason behind this difference is not only because it makes more sense to keep your home safe and comfortable inside but also because exterior work is usually more expensive. Schroeder Remodeling is a Myrtle Beach remodeling company that specializes in kitchen remodels, bathroom remodels, condo remodels and more. Schroeder Remodeling offers full carpentry, painting, flooring and general handyman services for all remodels. If you can dream it, we can design and build it. Schroeder Remodeling services the Grand Strand of Myrtle Beach. © 2016 Schroeder Remodeling. All Rights Reserved. Web Design by JW Designs, LLC.